It's that time again.. 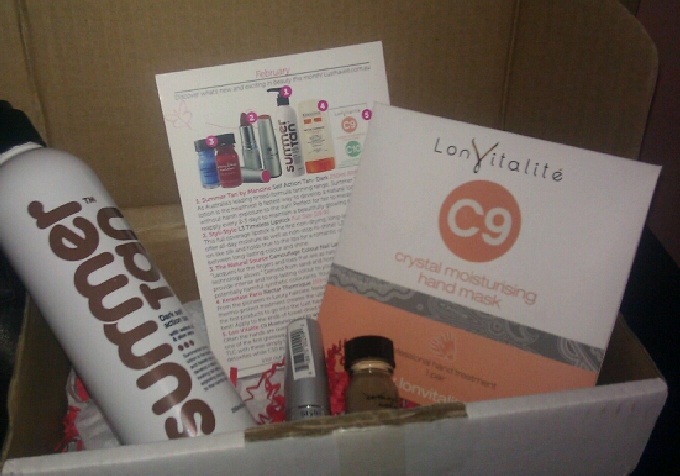 If you follow me on Instagram (@materialgurl_88 for those who wish to follow) you would have seen that I received my Lust Have It Box for February 2013 today. As usual I feel like I am the last person to receive my box but I'm slowly getting used to that so It doesn't bother me as much as it did. This month we got an email saying that the box would be arriving in the old cardboard box & not in the new packaging which is a shame because I really like the new boxes (see here for last months post) & that one sample would be being left out & sent out with next months box which is a bit of a bummer but I do appreciate the heads up. (1) Summer Tan by Mancine self action Tan in Dark Full Size 250ml RRP$29.95 - I know a lot of people aren't too pleased with this product & I understand why but I on the other hand don't mind it & I know I will use it as Summer slowly ends I rely on these kinds of products to help prolong or revitalize my Tan in Winter as I tend to pale up a little bit especially my legs. I think people were put of by the shade being Dark but I personally dont find it too dark this is definitely more of a medium when rubbed into the skin but It does come out of the bottle looking shockingly dark. I love the way this smells I used a little on my arm as was really impressed I will continue to use this & review it after a couple weeks of ongoing use if anyone is interested. 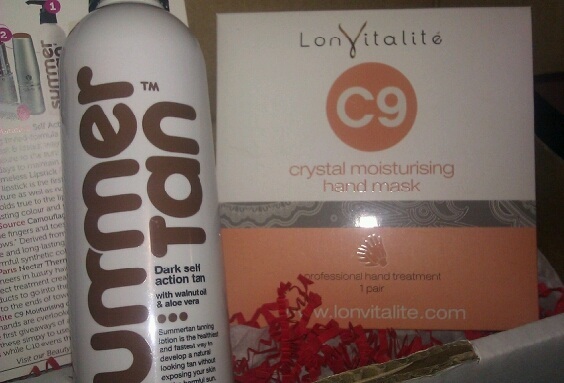 (2) Lon Vitalite C9 Crystal Moisturising Hand Mask 1 Pair RRP$4.50 - I'm pretty pleased with receiving this product as I've never tried anything like it before & I read a Review on the Crystal Whitening & Moisturising Hand Mask of Jasmine's Blog Sweetaholic Beauty (see her post here) so I'm definitely going to give this a try sometime this week & will post my thoughts on it :). (4) The Natural Source Camouflage Colour Nail Lacquer Full Size 12ml RRP$9.99 - There sure are a lot of full size Items in this box. This is the last item I received & I don't quite know whether or not I like it. I love the way this applies it was pretty much opaque in 1 coat but I applied 2 coats for the photo's below. The colour is not one I would ever chose nor do I have anything like it in my collection. I tried layering glitters over it to see how it would work & I do like the way it looked under my NYX Advanced Salon Formula Nail Polish in Gold Glitter It looks weird in the photo's but in real life I loved the way it turned out. 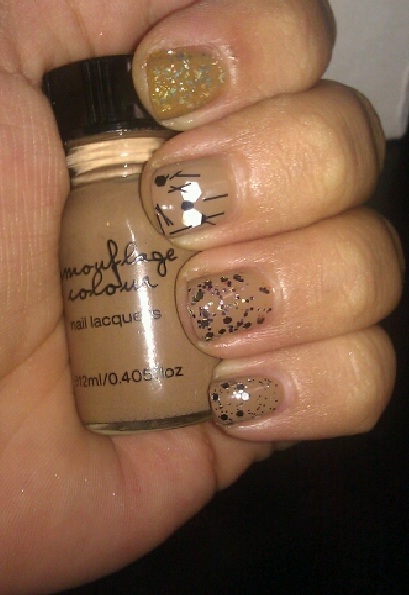 I do apologize for the bad quality of the photo's I've miss placed my Camera =O been too busy taken photo's of my nail polish swatches & don't know where it is so all of these were taken on my phone. Over all I'm not overly Impressed with this box but I definitely Don't hate it I will give most of these products another try & tell you all how its goes. What Box Did You Get? I think it's nice you share with your Mum, the most excitement I get from my boys was the OPI Not like the Movies duochrome shade I am wearing this week was "That would look great on a car!!" I was a bit disappointed in this month too but, hopefully next month will be a little better! I was so disappointed not to get the pretty box! you're welcome :) I cant wait to try it out either. I got pretty much the same box as you and I feel I'm getting mine a bit later as well. 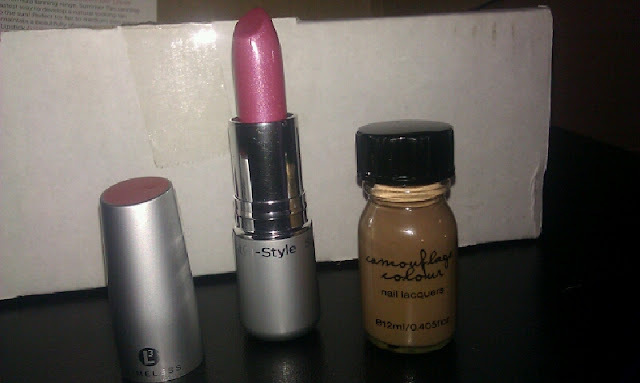 I probably won't use the taner but I'm looking forward to using my nail polish and lippie!. Great job on the blog really enjoy it. Your nails look so differently awesome~! Thank you for sharing its nice to see what people get in there boxes.